I would like to give you a small introduction to Bristol, one of my all-time favourite English cities! 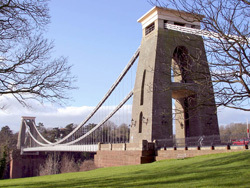 To give you a little bit of background, Bristol is located alongside the River Avon in South-West England and on a good day, you can see over the Severn Estuary into Wales. With its close proximity to the coast (the English seaside is just 10 miles away), Bristol has a strong maritime heritage and the city’s industry is founded on sea trade and ship building.